This book is all over the place, and I mean that in the best possible way. I was very excited about this book when it first came out and I bought it eight years ago. Roddy Doyle is a fabulous award winning Irish author, his book The Commitments was made into a movie in the 1990s, who has written a handful of children's books. I know that Lemony Snicket/Daniel Handler made digression in children's books popular and somewhat entertaining with his Series of Unfortunate Events books, the first of which was published a year before The Giggler Treatment, but I prefer Doyle's brand of digression for its humor and playfulness as opposed to Snicket's intellectualized, cynicism. The basic plot of revolves around the Gigglers - little creatures who look after children by following them around and making sure that adults are treating them fairly. When children are treated unfairly, they exact revenge on the adults by giving them the Giggler Treatment, or, poo on the shoe, until they stop being mean to the child. The Gigglers obtain the dog poo, for which all dogs are paid, with their poo claw. Anyway, the Gigglers target one Mr. Mack, biscuit (cookie, to us) tester, who, for almost the whole book, is about to step in a pile of Giggler treatment. His punishment is in limbo because, it turns out that he only sent Robbie and Jimmy Mack to their rooms for one minute after they broke the kitchen window for the eighth time. 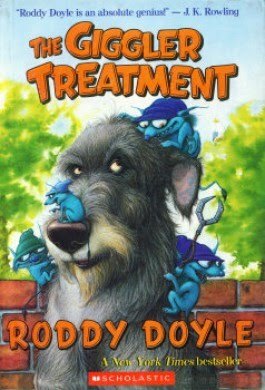 When a Giggler is discovered in the Mack back yard waiting to do business with Rover, the Mack's dog, the whole horrible mix-up is discovered. The whole family, with baby Kayla bouncing along on Rover's back, rushes to save Mr Mack. 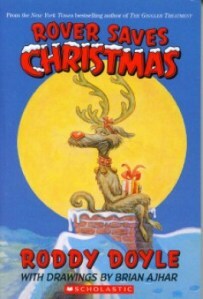 Rover Saves Christmas is the holiday companion to the Giggler books - I think it's out of print now but I'm sure you could find a copy somewhere!! My five and eight year old both absolutely loved this book - and I loved reading it with them! I'm not a big fan of potty humor - but this is just so much fun - I can't wait to read the sequel! Don't forget to look for ROVER SAVES CHRISTMAS!! Glad you liked the book! It is the best of the worst, in terms of potty humor. My kids loved learning about "wet rudies." Tanya, just to let you know that Ireland is not part of the United Kingdom :) I don't know if Roddy Doyle would be insulted by that or not. 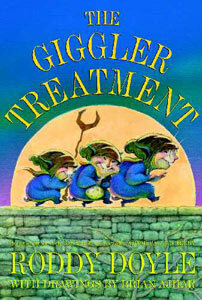 Anyway, the children in my class are really enjoying reading the Giggler Treatment. Thank you, thank you!! That is very good to know and, as cool a guy as I'm sure Roddy Doyle is, better to get it right. So glad to hear kids are still reading and enjoying his book!